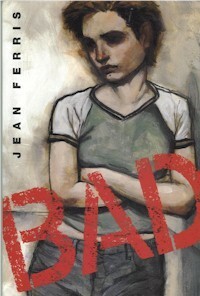 DearEditor.com’s Revision Week continues with Jean Ferris, author of more than ninetineen award-winning novels for young readers—some quirky fun, others intensely serious, all packed with thoughts well worth mulling. Please join Jean and The Editor for Day 2 of Revision Week, and enter to win today’s “Free Partial Edit” from The Editor. 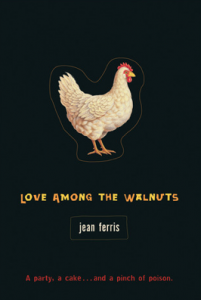 Jean Ferris has garnered awards and fans with her nineteen novels for young readers, including the beloved off-beat fairy-tale adventure trilogy beginning with Once Upon a Marigold, the delightfully quirky Love Among the Walnuts and Much Ado About Grubstake, and the riveting Eight Seconds and Bad. Flip to the back covers of Jean’s books and you’ll find lists of awards, like ALA Best Book for Young Adults, Junior Library Guild Selection, New York Public Library Book for the Teen Age, ALA Notable Children’s Book, New York Public Library 100 Titles for Reading and Sharing, and a Smithsonian Magazine Notable Book for Children. I had the pleasure of working with Jean during my time with Harcourt Children’s Books and was privileged to witness this master storyteller’s process first-hand. I’m happy to share a glimpse with you today. *Jean’s interview follows the Rafflecopter form for today’s Free Partial Edit Giveaway. Scroll down for her full interview. How many drafts does it typically take before you feel confident about the character and story choices you made? I know John Steinbeck supposedly wrote only one draft…because he had written the story over and over in his mind before he put anything on paper. And I have heard about stories writing themselves. Unfortunately, neither of these things has happened to me. Different books need different numbers of drafts, and there are parts of each book that need more drafts than others, so it’s hard to nail down a typical number of drafts…but always at least five. I tend to write what amounts to an expanded outline for the first draft, and each draft gets longer as I understand more and more what the book and its characters are about. You write your initial drafts longhand, then type them into a computer. Does putting your story through two different media impact your creative process? I know it is very antiquated…I might as well be writing with a quill pen…but every book begins as a hand-written draft on yellow legal pads. I believe it has been proven by neurologists that a different section of the brain lights up when writing by hand than when typing on the computer. And if it hasn’t been proven yet, I think it will be! All I know is, I feel that I have a different kind of access to my imagination when I am writing by hand than when I’m at the computer…a more thorough, deeper access. Also, I like to see the mess…the strike-outs, the rewrites on top of old work. It makes it seem more like mine alone. When I see a typed draft, it looks as if it could have been done by anybody. Hand-writing just seems more personal and gets me started in an easier way. But I do put the first, hand-written draft into the computer and revise from that. Do you use critique partners or advance readers? I would say the fourth or fifth draft gets shown to an editor. And I always know that there will be more revising ahead, though I always hope there won’t be! I usually think I’m pretty well finished by the time I show the work to an editor but there is usually a lot more to be done. I have taken out or added characters, added or subtracted subplots, scenes, whole chapters…and these revisions have always improved something I thought was just fine the way it was. Editing and writing are completely different skills. Some people are lucky enough to be good at both, but I need a good editor who isn’t me. Can you share an experience of having a story problem you didn’t think you could solve but eventually did? I can’t think of a particular incident but, while I know I often have trouble with transitions and with the reactions of characters to incidents, I still keep making the same mistakes. Almost every editor I’ve had has pointed this out to me, but I still need it pointed with each new project. Slow learner, I guess. I think I’ve got the final draft when I’m just sick of the story, and any changes I’m making to it seem to be making it different without making it better. I let it sit for a while and look at it again, and if I can then see ways to make it different AND better, I do that. If I can’t, I (mistakenly) think I’m finished. Thank you so much, Jean. 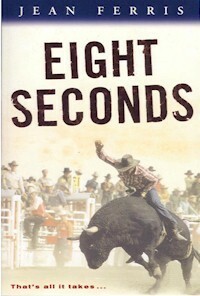 Talking to you about writing led me to talking about your stories with my nine-year-old sons. They’ve all enjoyed the Marigold books, and one now has Much Ado About Grubstake in his backpack to start at school tomorrow. 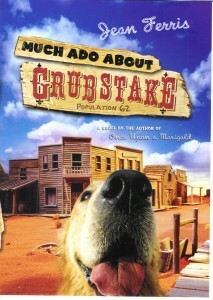 There’s a dog on the cover, of course, and what little boy can resist that? I know he’ll love the story as much as I do. Nice to learn about Jean’s process. I’m on the fence about being in a critique group. While they improve my manuscripts because critique partners see things I can’t, the differing opinions can be hard to muddle through. My daughter and I really enjoyed Once Upon a Marigold. Critique groups can certainly be hit or miss, depending on each writer’s needs and personalities, and the group’s dynamics. I’ll bet it IS true that different parts of the brain light up when writing longhand! Thanks for the post from Jean. My 11 yr old is a HUGE fan of the ONCE, TWICE and THRICE books. My problem would be READING my longhand draft. My penmanship is atrocious. Ack! Thanks for the post. Your comment about making changes without making the work better hit home. Glad to hear that insight resonated with you, Linda. Thanks for sharing that. I’ve tried writing the first draft out long-hand before, but unless it’s short, like a picture book, I get too impatient with myself because I can’t write as fast as the thoughts pour from my head. I can barely type fast enough! What Jean mentioned about critique groups is also a complaint that was voiced by a critique group friend of mine about another critique group she was a part of (apparently, there is often agreement among members in our current critique group about issues that it is helpful to her). But, I can totally see writing to please the other critique group members rather than yourself or even to suit your editor/agent. I hear you, T! I type ultra fast but it still doesn’t feel fast enough for rough draft brain-spewing. And my handwriting has gotten so bad, it’s like bird prints in the sand — undecipherable. Love it! I imagine walking in on your club meeting to hear the cacophony of scritch-scratching on legals pads. I totally agree about writing by hand leading to deeper connections in the brain. Things change once I enter a story on the computer, but I love putting my initial ideas onto paper. Thanks for this enlightening interview. Wow, a lot of long-hand first drafters. Who knew? Thanks for another great interview. I like Jean’s take on the final draft – perfect! I’m so glad you enjoyed this, Julie. I could talk to Jean for hours about writing and was so pleased she’s participated in this week. Hey, gang. I got the winner for yesterday’s giveaway: Noa Nimrodi. Congrats, Noa! (I’ll email you directly, Noa.) I intend to announce the winner of today’s giveaway early tomorrow so check tomorrow’s comment section. Thanks, Jean for sharing your process! 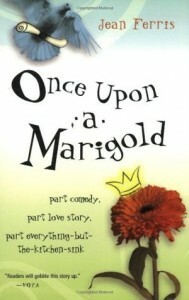 I loved “Once Upon a Marigold.” It’s fun to see she has other books. And yes, implementing critiques that suggest opposite solutions is HARD. Thanks for this interview! HI, all! Announcing the winner of today’s partial edit giveaway: Rosie Pova! Rosie, I’ll send you an email directly. Good luck to all in Wednesday’s giveaway. This was tremendously helpful! It shows how our brains are wired differently. Some people’s way of writing and revising would never work for me and other’s make so sense. Thank you.